I started French classes at the Sorbonne. The teacher kept saying “Formidable!!! !” in the sense that we are doing awesome! All I kept thinking was ah! formidable! Run the other way! Maybe I don’t know the true definition of formidable in English? The 50 year old ice cream man winked at me twice and said oooo tu es une belle americaine. wahaha chuckle chuckle I was just worried that they were out of Nutella ice cream. oh the travesty!! Said doctor magically understood English this visit too. My amazing friend that came to help translate think he brushed up on his English for my visit, or something like that…? I wrote an entire text that was longer than 1 sentence in French! I got asked for directions twice, once by an expat, the other by a French woman, all in the span of 20 minutes in my neighborhood. what?! 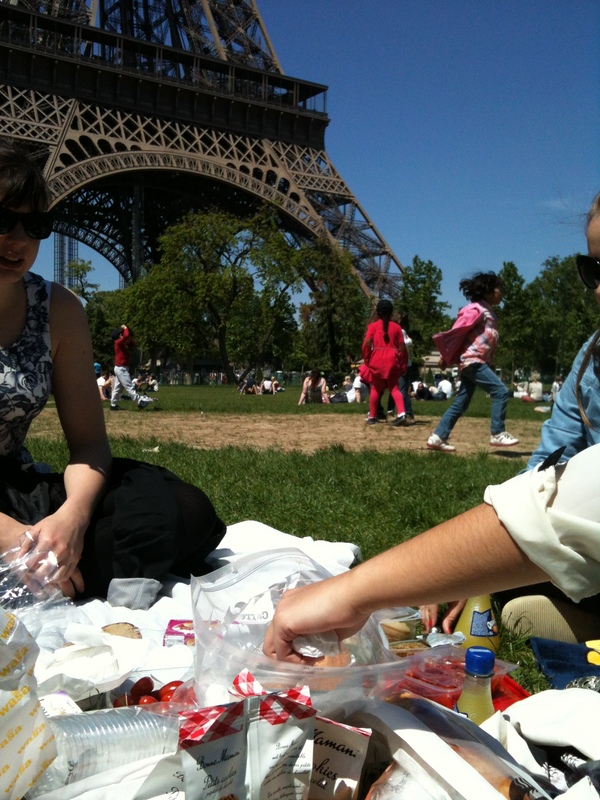 oh and we had a lovely picnic in front of the Eiffel! Because it’s finally warmer than 52 degrees! I LOVE Picnics!!! in Paris!! Like my posts? Subscribe by email with the link on the left hand side! And share to your friends! Ahh Molly! .. not only could you be picking up a parisian.. but a parisian doctor?? Ooo la la! Sounds like you’re having a wonderful time! Love reading your posts! I’m having an amazing time! Thanks so much for stopping by!